Any suggestions for a reasonably priced (cheap) way to paint a school bus? 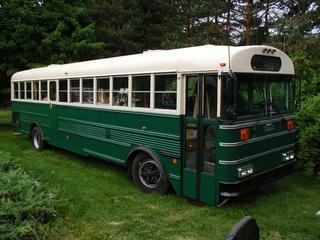 Will be starting work on a RAGBRAI bus this spring, adding the top deck, etc. What does automotive primer & paint go for? Any estimates on how much we'd need for a full-size school bus? Anyone in the Des Moines, IA area that does this kind of work on the side? So far the best and most economical suggestion (and the one I'm likely to try) is tractor paint and a foam roller. Of course you are then limited to the tractor manufacturers colors and what you can make by blending them. I bought a low cost Hi volume low pressure (HVLP) spray gun, and painted mine with Rustoleum Gloss White thinned with 10% acetone. Worked great, looked good, covered really well. How long it'll hold up is the big question. The Rustoleum is available in various gloss colors. I ended up using TrueValue XO Rust and a 3/8" nap roller (the foam roller didn't spread well at all. It covered in one coat and 18 months later looks just like it did when I first painted. I couldn't find Rustoleum that was in gallons and tintable. I was after a specific color scheme. Anyway, I thought I would share my notes here from my build thread. Learn from my mistakes. The paint is done. We ended up going with Olympic Alkyd from Lowes. They tinted it in Aggie Maroon. We used 1.5 gallons on the roof, almost 4 gallons on the sides, and maybe a pint or two on the window touchups. We started with taping off the top and spraying it first. Then we taped off the windows and covered the top to paint the sides. Then we came in by hand and cut around the windows. Unfortunately it rained both days that we did most of the painting. It rained about an hour after the white and we had just finished the last coat (3 total) on the sides and it started coming down. It dulled the paint quite a bit. It's still soft a few days later. Hopefully it will harden up well with a few days of good sun. Overall it's not an "auto quality" paint job at all, but for less than $300, it does the job for an old beater tailgating machine. It definitely made it look a lot better. I've had a few questions about the paint I used. I used Olympic Alkyd Gloss Oil Based paint from Lowe's. Home Depot did not have gloss oil based paint. We did some tailgating for the first time yesterday and got to compare it side by side with a few others. I'm not sure how much the rain had to do with the outcome of ours, but I wouldn't recommend this paint. Ours is stil drying after 5 days. It has a crackle looking texture to it. It's not shiny at all. I met a guy tailgating, I think he's on this board also. Fellow Ag. They have a porched out International bus. Pretty fun. I have some pix to post. They spent an equally miniscule amount of money and have a lot better end product. They used Acrylic Enamel that they purchased online from http://www.tcpglobal.com/. They sanded down to bare metal, which they later found out was not necessary. Because of that they had to spray primer. Sand. Paint. They sanded between coats which they also found out later was not necessary (600 grit). Painted 2nd coat. So they did a lot more work than they needed to do, but the end result is pretty nice. So after reading, trying, and revewing again, this is my recommendation for painting a bus yourself for under $500. 1. Buy Acrylic Enamel paint. 3. Wipe down with thinner after sanding. 4. Tape off areas that you don't want painted. 5. Spray on 1st coat. Wait 45 mintues. Spray 2nd coat. 6. Remove the taped off areas right after spraying. This will help the "lip" of the paint roll over while still wet, instead of having a hard (dry) line after it dries. So while I haven't done it exactly like this, this is what I would recommend and what I would do if I had it to do over again. Specifically one user talks aobut spraying with a more traditional auto sprayer (running off of compressed air). They can be had for cheap (he said $50 at WalMart). I used a hig pressure low volume (HVLP) airless Spraytech (Wagner) home painter. I didn't cut the paint at all. It sprayed fine, but not the best results as I noted. I would definitely recommend using a sprayer over a foam roller. It took longer to roll just round my windows than it did to spray the whole rest of the bus. We painted it all in less than two days of work. In the end, I think the most important item is using ACRYLIC ENAMEL. i've painted and repainted a total of about 5 times. I think that rustoleam commercial grade by the gallon is a good way to go. I also like spraying it simply because the surface isn't exactly flat, but i've done a lot of touch ups with a roller and think that also looks fine. Where the sprayer will really help ya out is on the last step. I recommend that anyone who paints with rustoleam use an automotive clear coat when you're finished. 1 gallon of clearcoat is enough if you use it sparingly, but it costs about $100 for that gallon. Money well spent ! I use about 3 gallons of paint to cove the bus, and about 1 gallon of primer. 2 Gallons of acetone, and don't forget a gallon of paint thinner (mineral spirits, none of that safe non toxic low oder stuff!) to wash the bus with after you sand it, and between coats. Interesting. That's one thing that they were recommended and said specifically not to do, sand between coats. Said it wasn't necessary. I'm also curious as to sources on the Rustoleum. We looked all over the place for it here and in Houston. No dice. Any national chains carry it locally for you? Home Depot. Sherwin Williams. Lowe's. WalMart. etc. rustoleam commerical by the gallon paint is available here in michigan at both home depot and at wal-mart. Although not for sale online, it is on their website. It's not tintable though. Maybe that was the real issue. That they didn't have a way of getting it in the correct color scheme. We were adament about getting at least some form of maroon (school color). Primer, Almond, Aluminum, and Black wouldn't fit what we were going for. Sorry, kind of thinking out loud (on the keyboard).